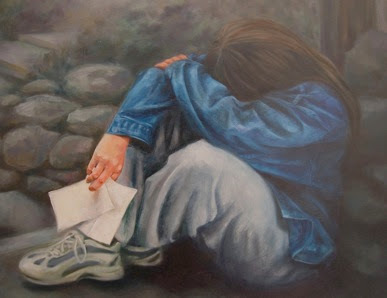 Blue oil 2004 approx 20" x 20"
For Think about it Thursday of course I have been thinking about rejection. It's something artist's definitely have to come to terms with in their profession. But I think almost everyone experience's rejection at some point in their lives. So, my question is how do you get over or move on from rejection in your life? What do you think? What do you do? Wow that's a tough one. Rejection I guess to me in a way is similar to failure. In that because you are putting yourself out there and someone doesn't accept you or what you have to offer. That makes me feel like I have failed at something. And sometimes failure is hard to accept. I believe you are responsible for your own happiness and it's a choice. You can wake up each morning and decide to be happy or not. So to me I would get over or move on from rejection in the same way. It's just something you have to understand and realize that not everyone is going to like what you do or who you are. As long as you know yourself, your talents, strengths, weaknesses, etc. and are happy with who you are then that's what matters. So that is how I would deal with rejection, to accept and understand that others have their reasons, to respect their choices and to move forward. The way that I deal with rejection is to not personalize it. Maybe what ever I'm offering is not what they are looking for AT THAT TIME, but it does not mean that what ever I'm offering is not good. For example, when you go to McDonald's and they say, "do you want fries with that?" and you tell them "no". It doesn't necessarily mean that you never want fries, it's just that you don't want them now. So, there may be another time or instance where someone wants or accepts what ever it is that you're offering. This has been my new philosphy with my business. It sure helps to not get down about things. I hope it makes sense. Matthew says, "the batting cage". Whew, I've finally gotten to the point where I'm wiling to try. I use to be so afraid of failure and rejection, that I wouldn't even dream. And now, I can't sleep because my mind is going a million miles an hour. Back, on point, I think I deal with rejection by praying for humility and help. And then just dust myself off and like the previous have said, don't take it personal. I've come to the conclusion, if you know who you are, rejection isn't so bad. Oh, I meant to say, that painting displays rejectino so well, and it brings emotion. I feel the rejection, just by looking at it. For me I wish I could say I learned, prayed, was grateful for the experience, but none of those apply. When I have been rejected in my life, I just kept going. I would use that energy of anger and frustration for something I am good at, like exercising or cleaning, or keeping photo albums and records. And eventually the hurt goes away, but for me it unusually takes a while.